They have a communal dining area in the center, shaped like a big U, and more private booths and tables on the side. We came relatively early and so were able to snag a booth. Here's a picture on their wall, very indicative of what was to come. 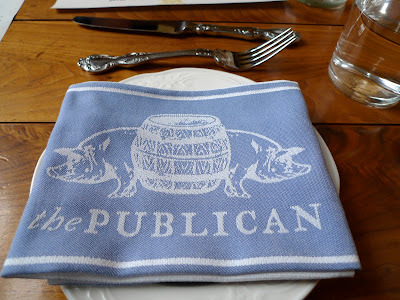 Here's a picture of their adorable table setting, which was put to quick use when the bread arrived. 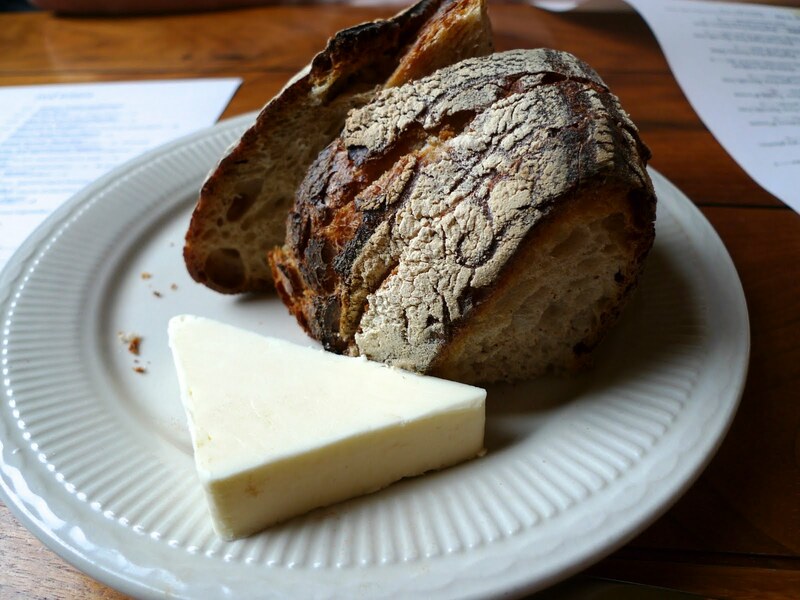 There's nothing like a crusty loaf of bread with some butter to wet the appetite. My favorite dish of the night was the first dish that arrived. 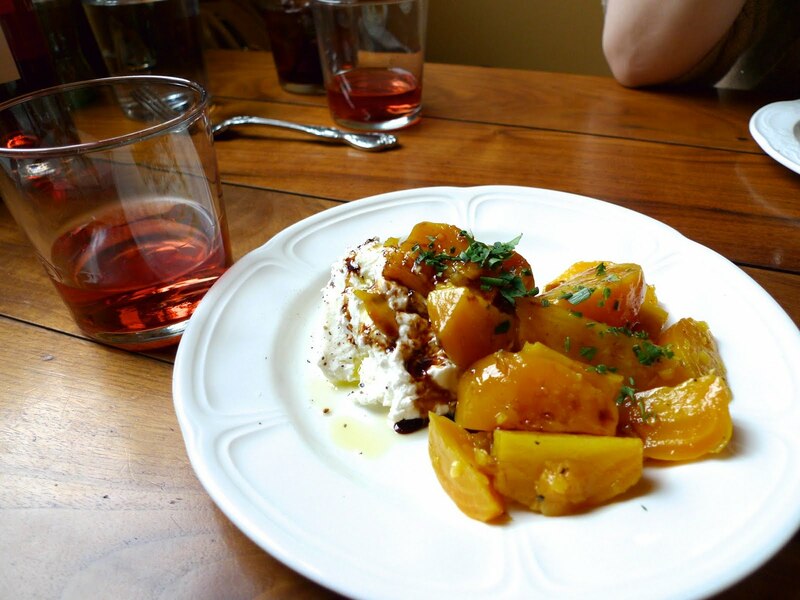 The burrata was unbelievably creamy and the beets were so sweet. Is it crazy that I secretly want to have a beet farm like Dwight Schrute? Aleen asked what the beets tasted like and Susan said, "these taste like pomegranate." Pomegranate? Really? The red fruit with the tiny seeds? I was trying to figure out how on earth beets taste like pomegranates and wondered if we indeed were eating the same thing ... until I prodded her more and figured out that she was referring to persimmons. haha. We got a good laugh out of that one. That definitely makes more sense. They had the same golden yellow color and tasted just as sweet. 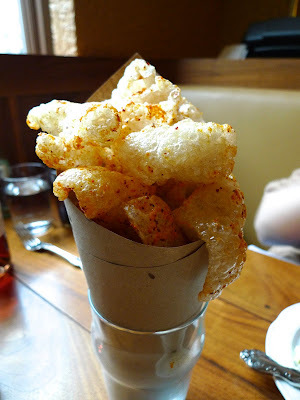 Spicy pork rinds with the pork from Slagel Family Farm, Fairbury, Illinois were next. These come piping hot in a paper cone. These were so hot from the fryer that you could hear the fat crackling. I leaned in to hear the sound but jumped back a bit fearing the hot pork oil would go into my eye. I've never had pork rinds before. I wasn't sure I would like them to begin with, but everyone raves about them, so I thought I'd naturally like them as well. It was like biting into a crunchy chip that sent fireworks exploding in your mouth. The downside however is that then you have the embers from the fireworks slowly collect in your mouth. It had the perfect amount of heat and spice, but it left an oily film in my mouth, which I didn't enjoy so much. I think one or two was all that I could really eat. Jung - I thought of you when I ate this. I wished I could teleport this to you so you could taste it. I think you would have loved this. Here's an up close and personal shot. 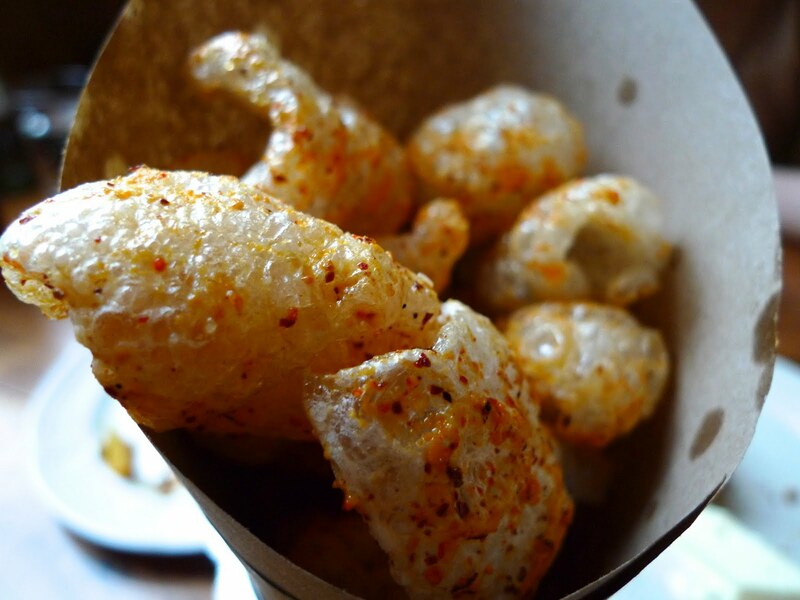 Can you believe this is from pork skin? How can you fry skin like this, I will never know. The waiter told us that they were known for their seafood and pork dishes, but to balance it out, we decided on a chicken entree as well. We got the half order of the chicken from the Slagel family farm in Fairbury, Illinois, with summer sausage and frites. 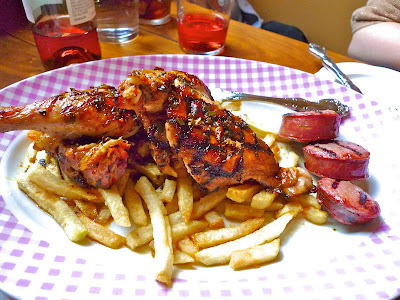 The chicken was moist and perfectly cooked, but I have to admit my favorite part was eating the fries soaked in the juices from the roasted chicken. The fries didn't look all that different from any fast food joint's, but man ... with the juices from the chicken, they were pretty darn amazing. I felt like I was eating food at a country fair, it was so simple, but so good. 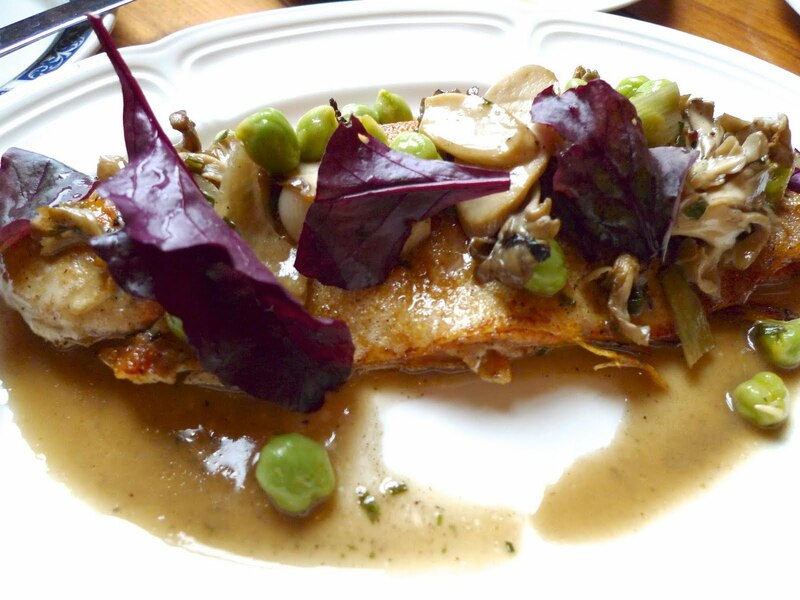 Here was the golden trout line caught from Clear Springs, Idaho with trumpet mushrooms & fresh green chickpeas. The golden trout was pan fried golden yellow, but inside had the loveliest pink color. Clearly I need to eat more trout because this was delicious. I've never seen chickpeas this big, have you? I don't know what was in this sauce, but the trumpet mushrooms was the perfect accoutrement to soak up all the yummy juices. 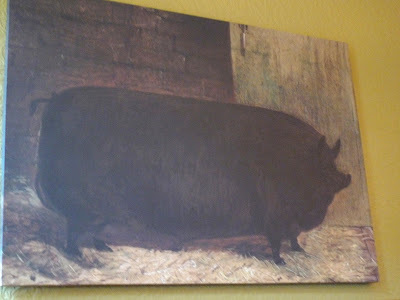 When we asked the waiter which pork dish was the best, between the pork belly, country ribs and ham chop, he said the ham chop "in hay" was really good. 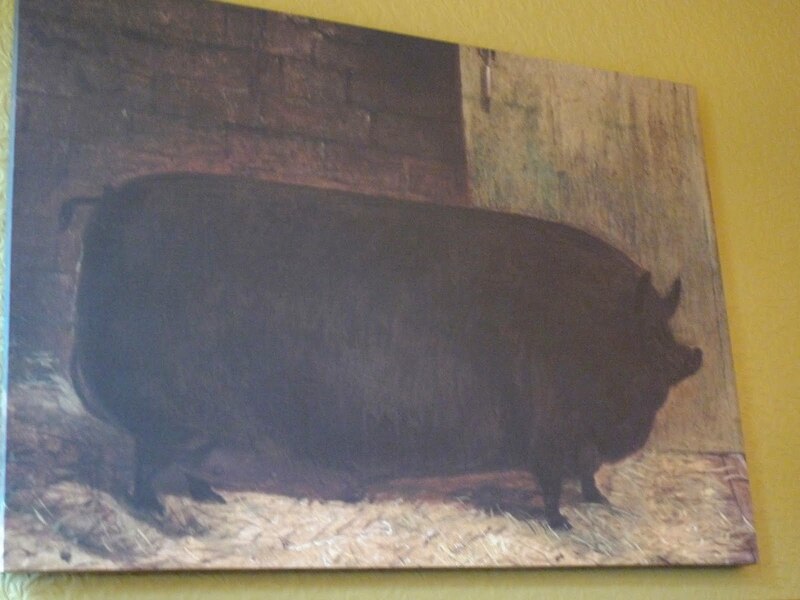 We asked what the "in the hay" meant and he said that they put the ham covered in hay in a round bowl in an oven. The hay burns as the ham cooks and locks in the moisture of the ham. I was hoping for the pork to come with the residual hay, but no such luck. 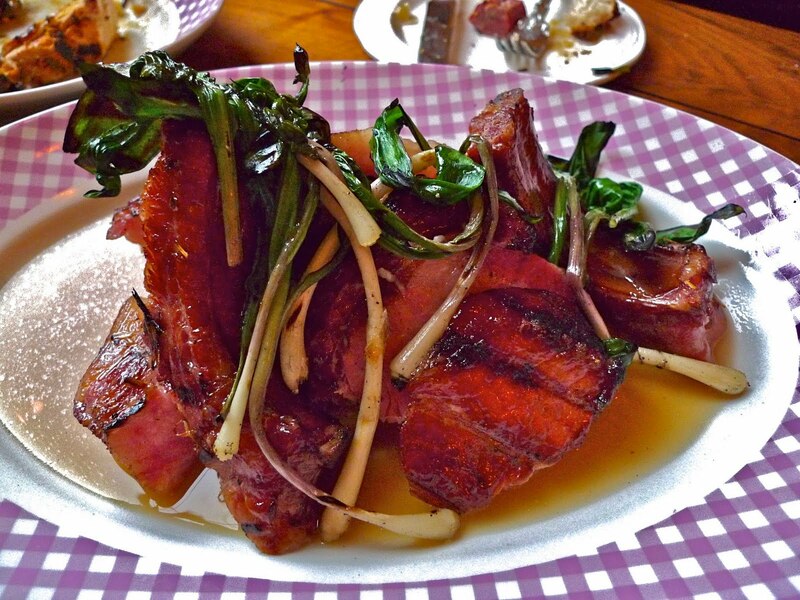 The Berkshire ham chop "in hay" from Heritage farm, Iowa, with ramps & grits was enormous. The waiter did mention the largest entrees were listed at the bottom. We somehow ended up ordering the biggest seafood and meat dishes. I was there was more grits in this dish, because what I did taste of it was fantabulous. They were so creamy and buttery. The ramps were pretty fantastic too. I can't wait to see them at the farmer's markets when summer approaches. I felt like I was eating an Easter dinner. To tell you the trust, I could have done with less ham and more ramps and grits. Grits and ramps were pretty outstanding in this dish. 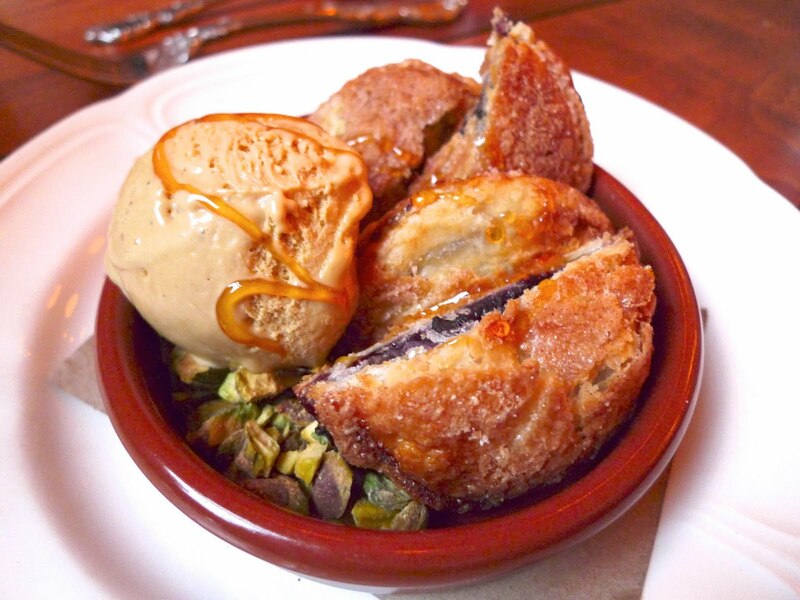 We were so full, but desperately needed to get the pork taste from the pork rinds out of our mouths so we opted for a dessert of Seedling farm blueberry pie with pistachios & honey-black pepper ice cream. I was fully expecting a slice of blueberry pie, but it was two little empanada looking pies cut in half sitting on top of a layer of roasted pistachios. The blueberry pie was alright, but I was hoping for some chunks of blueberries in this. It almost tasted like they just use blueberry jam for the filling, which was kind of disappointing. The combination of the honey-black pepper ice cream with the salty roasted nuts below, however, was perfection. Overall I wasn't as big of a fan of the pork dishes namely because it left such a porky aftertaste in my mouth, but I loved the beets and burrata dish and the fish and chicken dishes were pretty spot on too. I hear their brunch items are pretty fantastic too. I think it definitely warrants a revisit in the future. I also saw the Charcuterie Chef Erling Wu-Bower walk in and out of the kitchen a few times. Is it possible to be a chef groupie? If so, sign me up. I think he's a hottie ... speaking of hotties, we need to make a trip here soon.